Aerial lifts have replaced ladders and scaffolding on many work sites. They have also helped to improve the safety and efficiency of many types of projects. However, OSHA investigates an average of 26 aerial lift-related deaths each year due to not complying with safety standards. It helps to know about the most common OSHA safety violations. There’s a decent chance you might be non-compliant with many different safety regulations, and getting rid of them will make your workplace safer for everyone! -Not applying too much strain when trying to access hard-to-reach areas. Sometimes, scissor lift and aerial lift operators are required to work in confined spaces, with less-than-ideal ventilation. Respiratory protection violations were reported over 3,000 times in 2018, and remain a significant working hazard for lift operators. OSHA recommends different types of equipment to protect yourself from vapors, mists, fogs, smoke, and other potentially hazardous substances that can be breathed in. Check out the OSHA Respiratory Protection Health Topic for helpful tips & tricks for optimal safety strategies. If your aerial lift or scissor lift is in for repairs or maintenance, it should be locked out / tagged out. This means that nobody is authorized to operate the lift as normal. Almost 3,000 lockout / tagout violations occurred in 2018, putting this type of hazard inside the top 5. If you’re not sure about lockout or tagout procedures, consult with your supervisor or safety coordinator. While the top OSHA safety violations typically change from year to year, here’s something that always remains constant: aerial lift and scissor lift safety training is still the best way to prevent injuries and accidents. Employers are responsible for providing this training. 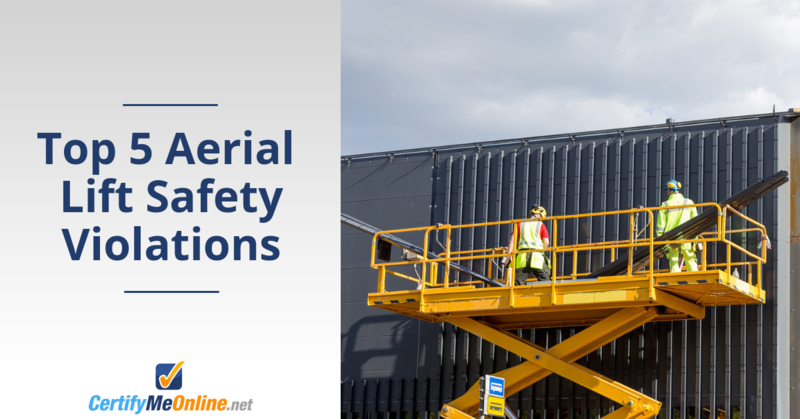 CMO, the leader in online aerial lift and scissor lift safety training, offers a full selection of OSHA compliant courses to keep your workplace safe. Plus, your employees will have proof of training in the HR records – and that’s critical during an OSHA audit or investigation! There are plenty of safety tips to help avoid hazards and violations, but a lack of training is almost always behind aerial lift accidents. In an aerial lift certification class, workers will learn about the various safety hazards involved with aerial lifts in deeper depth, including how to recognize them and avoid them. It takes training to understand how to operate an aerial lift safely and to apply quick thinking in an unsafe situation. If you’re interested in protecting your life, check out CertifyMeOnline.net to receive your OSHA-compliant aerial lift certification today. If you’d like to speak with our aerial lift and scissor lift training experts, please call us at (602) 277-0615. Thank you for considering CertifyMeOnline.net for your safety training requirements!